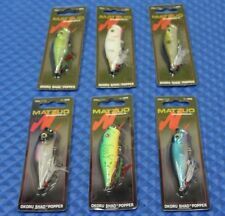 Matzuo Okoru Shad Popper Topwater Rattle Lures 1/4 oz. EACH SOLD SEPARATELY!! 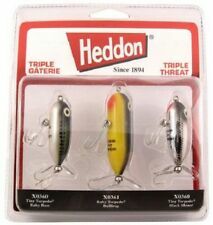 Anglers have depended on the Heddon Torpedo to produce bass after bass with violent, soul-thundering strikes. Hunting & Tactical. These three Torpedoes in the most effective color patterns feature high quality components for years of fishing. The Rebel Pop-R is no stranger to redfish or speckled trout in the Gulf, and it knows stripers and bluefish off the beaches in the Northeast, too. Hunting & Tactical. Rebel Super Pop-R 5/16 oz Fishing Lure. Arbogast Hula Popper 5/8 oz Fishing Lure. Hunting & Tactical. Lure Length: 2 1/4". Survival & Safety Gear. Safety & Reflective Gear. MMA & Boxing Shorts. White/Red Head. Kid's Clothing & Shoes. Hunting & Tactical. 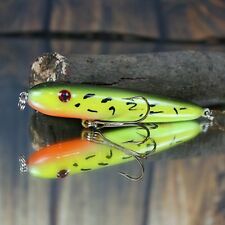 Rebel Pop-R 1/4 oz Fishing Lure. Shin Guards. Lure Length: 2 1/2". Survival & Safety Gear. Fire Tiger. Punch Mitts, Thai Pads & Shields. Safety & Reflective Gear. Blue Darter. Hunting & Tactical. Rebel Super Pop-R 5/16 oz Fishing Lure. Shin Guards. Lure Length: 3 1/8". The Rebel Pop-R is no stranger to redfish or speckled trout in the Gulf, and it knows stripers and bluefish off the beaches in the Northeast, too. Smithwick Devils Horse 3/8 oz Surface Lure. Hunting & Tactical. Shin Guards. 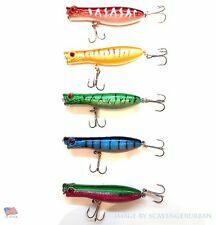 Lure Weight: 3/8oz; Lure Length: 4.5". Use 6-20lb test fishing line depending on lure weight and rod action. Cranking Depth: Topwater/Surface Lure. Type: Blank Topwater Popper Lure Body. Depth: Topwater. Topwater Popper. 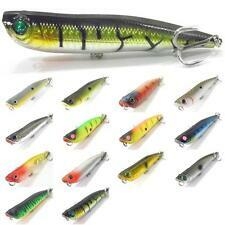 Check Out All Fishing Lures We Have. Free 3D Hard Fishing Eyes. High Quality ABS Construction. Quantity: 10 Lures. Weight: 3/8 oz (10 g). Resistance Training. Hunting & Tactical. High Altitude Training. Imagine stopping your buzzbait right next to that stump and letting it float there, then twitching and shaking it to entice a big bass to strike. 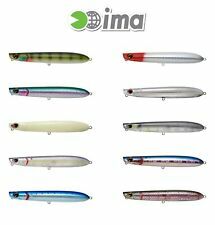 Type: Blank Topwater Lure Body. Topwater(Walking The Dog). 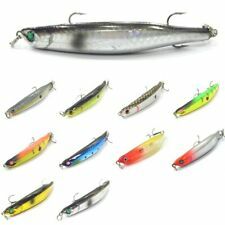 Check Out All Fishing Lures We Have. Free 3D Hard Fishing Eyes. Hook Size: 4. Weight: 1/2 oz (15 g). High Quality ABS Construction. Quantity: 10 Lures. Lucky Craft’s 5” Sammy 128, in a great JDM color. MJ GHOST WAKASAKI. Each Sammy 128 is 5" and 1 full ounce. This larger size sits tail down at rest, and can effortlessly perform long, slow, lazy strides, or frantically jump back and forth with a popping action that often resembles a baitfish jumping almost straight up for a gulp of air. Excalibur Jimmy Houston Super Spook - topwater fishing lure. Condition is New. Shipped with USPS First Class Package. Hunting & Tactical. Lure Length: 2". Survival & Safety Gear. Safety & Reflective Gear. Hooks: #4 Treble Hooks. Cranking Depth: Topwater. Species: Largemouth Bass, Smallmouth Bass, Northern Pike. Fitness Outdoors Running Team Sports Apparel Boxing & MMA. Two high quality carbon steel treble hooks. - Attracts fish with sound, action, flash, vibration and color! - Internal chambers filled with shot to producing a superior rattling sound and vibration that attracts fish from far distances! Storm Arashi Top Walker Color: Ghost Hitch Size 13 Swimming Depth: Topwater Length of Body: 5-1/8" Weighs 1-1/8 oz. Hook Size: 2. Hunting & Tactical. Rebel Pop-R 1/4 oz Fishing Lure. Shin Guards. Lure Length: 2 1/2". Survival & Safety Gear. Punch Mitts, Thai Pads & Shields. Safety & Reflective Gear. Kid's Clothing & Shoes. 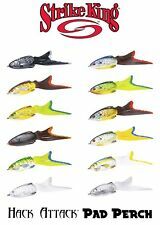 Type: Blank Topwater Lure Body. Depth: Topwater(Walking The Dog/Popper). Topwater(Walking The Dog/Popper). 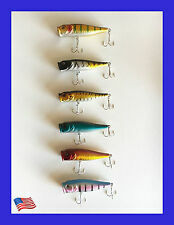 Check Out All Fishing Lures We Have. Free 3D Hard Fishing Eyes. Weight: 1/2 oz. High Quality ABS Construction. Hunting & Tactical. Lure Length: 2 1/4". Survival & Safety Gear. Safety & Reflective Gear. Hooks: #1 Treble Hooks. Cranking Depth: Topwater. Species: Largemouth Bass, Smallmouth Bass, Northern Pike. Water Sports.